1. What if I can't find my school? To locate a particular school, go to the search field on the top right of your screen, type in school name, and click the SEARCH button. If your school is not listed, you can still order a custom frame using Create-A-Frame. 2. How quickly can I expect to receive my order? All frames are individually made to the specifications of your institution or to your specific requirements. Our standard production time is 5–7 business days, plus FedEx ground transit time from our facility in Connecticut. As a general rule, you should expect to have your frame “in hand” in 10 business days. If you need your order sooner or for a specific event or date, we offer expedited delivery options during the checkout process. An email will be sent from info@diplomaframe.com with the tracking number once the order ships out. 3. Do you offer a secure checkout? If the frame you’re interested in is available at one of our partner bookstores or resellers, you can always call or stop by this retailer to make your purchase in person. 4. How do I get a promo code? As part of our pricing policy, we have worked hard to give you the best price, every day, on our high-quality, USA-made products. Be the first to know about occasional special offers by joining our email list. We guarantee your privacy and would never rent, sell, or share your information — we promise! You may also unsubscribe from our mailing list at any time. 5. What happens if I make a mistake or change my mind after placing my order? We understand that mistakes do happen. If you realize that your order needs to be changed or cancelled, please contact us immediately by email at info@diplomaframe.com or by phone at 800-477-9005. 6. Can I include a personal message with my order? Yes, we’re happy to send a requested gift card along with any frame ordered. 7. For Create-A-Frame orders, where do I enter the document's exact size? To get started, click on the Document Size button and select the “Up to….” Estimated Document Size in the drop-down menu to set the pricing (see below). At the last step in the design process, the system will ask you for the ACTUAL paper size and EXACT printed area size. We use those dimensions to custom-design your frame so that it’s a perfect fit. 8. For Create-A-Frame orders, how do I measure my document? When ordering on Create-A-Frame, we need to make certain that your document fits perfectly with your new frame. You’ll be prompted to fill out the actual paper size, where you take a ruler or tape measure and measure the exact height and width of your diploma from edge to edge. You’ll then need to fill in the exact printed area size. This refers to the measurement of the actual text and/or seal from left to right and top to bottom of the document. Please be sure to use decimals and not fractions, or your order cannot be processed. 9. For Create-A-Frame orders, what is the difference between "actual paper size" and "printed area size"? "Actual paper size" is the overall physical size of your document, while "printed area size" is where the printed text or image begins to where it ends. To get the printed size area, you must measure from the top of the highest lettering to the bottom of the lowest image (usually the seal or signature) and the same applies to the lettering from left to right. This ensures a perfect fit for your document. Our standard shipping method is FedEx Ground. Each item is fully insured and shipped in a specifically designed FedEx-approved box. In the rare instance where damage in transit may occur, rest assured that we will replace the product promptly and handle the claims process on orders shipped from our facility. 2. Do you offer international shipping? Yes, we do offer international shipping. International shipping rates vary widely based on location, speed of service, and package size. As part of the online checkout process, you will have the opportunity to obtain a price on international shipping based on various levels of Fed Ex service. To determine the delivery timing, please add our 5–7 day “production time” to the transit time for the type of international shipment you select. We have found that FedEx provides the best combination of rates, reliable delivery, dependable insurance coverage, and up-to-date tracking. FedEx will not deliver to PO boxes; therefore, we will need a street address for delivery purposes. 4. How do I ship to an APO address? 5. How long do I have to return my frame if I decide I don't want it? Our goal is to assure that you are delighted with your purchase. If you’re not satisfied for any reason, please let us know. Your purchase is refundable within 120 days of receipt. At your discretion, we’ll either replace the product or issue a refund of the purchase price of the item, less shipping and handling charges. Click here to view our full return policy. Please contact our Customer Service team at 800-477-9005 with any specific questions. 6. Can I return my item that has a personalized engraved plate? Engraved plates are a nice, personal touch available on many of our gift items and varsity letter frames. We want you to be happy with your purchase, so if you have any problems, please let us know. If we make an error on your engraved plate, we will correct the mistake. If there is a product defect or damage, we will happily exchange your purchase and make it right. Otherwise, gift items with a personalized engraved plate are not returnable and are non-refundable. If you have an order problem or a return, please contact us at 800-477-9005 so that we may assist you. All returns must be received back to us in new, undamaged condition and in original packaging. 1. Do you sell premade frames? We don’t have boxes of mass-produced frames stacked in a warehouse—every frame is custom-built by hand for each order. We take great pride in the craftsmanship and quality of our frames and create each one with a specific individual in mind. 2. What materials do you use for your moulding? Our frames are crafted of solid hardwood with a variety of distinctive furniture finishes. We take pride in producing high-quality frames right here in the United States and, as such, are very selective about the quality of our frame mouldings. 3. What is archival-quality matting? Archival-quality matting and backing boards are acid-free and lignin-free in order to protect your document from damage and deterioration. These materials are also referred to as “conservation quality,” and they meet stringent Library of Congress standards for document preservation. Standard mat board is buffered to a neutral pH, so it’s referred to as “acid-free,” although the material is not inherently pH neutral and will gradually change pH over time. 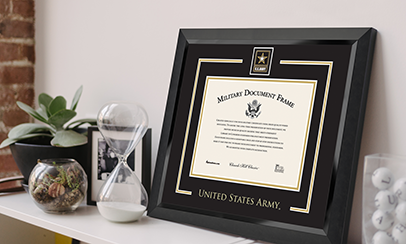 When framing a valuable document or diploma, It’s critical to avoid any acidic exposure; acids will eat away at the cellulose in your document, causing the paper to turn yellow and become brittle. 4. Why is the backing board so important? To ensure the safety and long-term preservation of your documents and photos, we only use archival-quality backing board. Corrugated cardboard, pressed wood, fiberboard, and other products will cause discoloration and brittleness over time. When improper backing materials are used, the document typically turns yellow, exhibits cracking, and may even develop striation marks that match the pattern in corrugated board. To reverse or reduce such damage, you should contact an experienced conservator. For more information on these services, contact the American Institute for Conservation (AIC) at (202) 452-9545 for a referral. 5. How do I attach my diploma to the backing board? We provide archival-quality mounting materials with our frames. These materials are considered archival, because they’ve been proven to be completely reversible and safe for use in direct contact with valuable documents and artwork. Each frame comes with a step-by-step instruction sheet illustrating how to use these materials and easily frame your document. Never use glue, staples, paper clips, or masking, scotch, or duct tape—these items can permanently damage your document. 6. How do I mount my frame? Every frame purchased includes our Level-Lock® Hanging System. It includes all the necessary components to mount your frame professionally and easily. You can purchase our Level-Lock® Hanging System to use on other frames as well. To use the Level-Lock® Hanging System, follow these easy-to-follow instructions or watch a short video demonstrating the Level-Lock® Hanging System. 7. Can I emboss a school’s name on the matting? We can’t emboss a school name on Create-A-Frame matting due to licensing requirements, but you can still design your frame with matting in your school colors. 8. Do you carry tassels, sashes, or pennants? No, we don’t sell sashes, tassels, or pennants at Church Hill Classics. Since your school typically provides you with a tassel and/or a sash appropriate to your degree type at your graduation, we do not include a tassel or sash with your frame. Our frames have an easy-open back that allows you to readily insert your tassel and/or sash with step-by-step instructions . 9. Are two mats better than one? Using one mat or two mats is merely a matter of personal preference. There’s no difference in terms of document protection. Customers who opt for two mats often choose a dark outer mat (black or navy) and either an inner mat in the school color (red, for example) or in gold (a popular and versatile accent color). 10. Do your frames include glass? Yes, our frames include regular picture glass with upgrade options for reflection control, conservation UV protection, or conservation UV & reflection control. Frames for single documents over 14" x 22" and double documents/campus images over 11" x 14" will be produced using Plexiglass for safe shipping. 11. 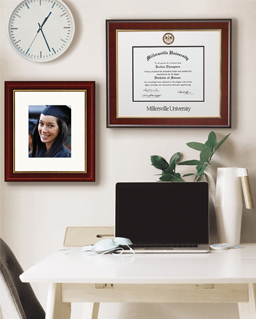 Do you only make frames for diplomas? We offer a wide variety of frames designed to showcase important documents and mementos. 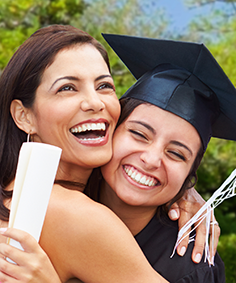 This includes frame options for portraits, medals, flags, awards, coins, honor certificates, professional credentials, graduation sashes, military documents, and school, team, or keepsake photos, as well Greek sorority and fraternity initiation certificates or photographs. View our various frame categories. 12. Can I just purchase a medallion? We’re unable to offer individual medallions for sale. 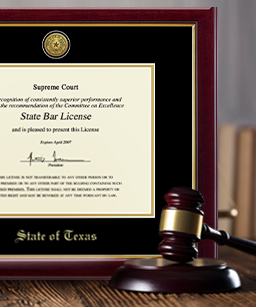 We have licenses for the majority of the medallion products that we sell, and our licensing approvals apply to the entire frame, including the medallion. 13. Can I just purchase an embossed mat board? Due to the requirements of our licensing agreements, we’re unable to sell individual mats. We have permission to sell the complete framed product only. If you’re looking for a particular frame style or to match a product that you already own, check out our Create-A-Frame page or feel free to contact us for assistance at 800-477-9005 or at info@diplomaframe.com. We offer a wide range of frame moulding and mat color options and should be able to meet your needs. 14. How do I get the gold or silver plates for the pen sets and desk boxes engraved? These items are sold with the personalization plates enclosed in the box. Personalization is available by mail for $10.95 and an order form and mailing instructions will be included with the plate itself. Our engraving charge allows for two lines of text, each having 30 characters. Please note that blank spaces count as characters. Normal turnaround time is 5–7 business days. If it’s more convenient for you, our plates can always be taken to a local engraver. 15. Where should I hang my frame? It’s best to hang your diploma away from direct sunlight in a location that’s dry and free of dramatic temperature shifts. Exposure to direct sunlight speeds up oxidation, which can lead to the gradual bleaching or discoloration of the document paper. Dramatic temperature shifts can also lead to the deterioration of your document as well, since paper fibers expand in humid climates and contract in dry temperatures. You don’t want to store your diploma is a damp basement or in a high-humidity location because such conditions can promote mold growth. It’s best to hang your frame in an area that’s 70 degrees Fahrenheit and has 50 percent humidity.